Calabria genealogy and the diverse origins of the region make for an extremely interesting pastime. Many of our members are very active in this particular facet of our studies and actively assist other members to get started in their own research as well. 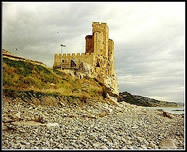 Calabria history is rich and extremely diverse and starts around 9000 BC. which has been determined from early cave paintings. Our region has been known by a number of names: Italy, Magna Græcia, Bruttium, and now Calabria. With each invading group, Calabria culture became continually more rich and diverse. This impacted the foods, cooking style, artistic expression, architecture, religious doctrine and shaped the thinking of the people of Calabria. As with the cultural impacts from various conquests, the languages spoken within the region have diverse origins. Add the rough mountainous topography into the picture and we see the Calabria language diverging ever more rapidly from location to location. Welcome to Il Circolo Calabrese! 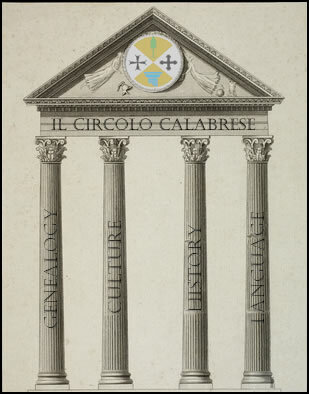 Our organization is founded upon four basic pillars with regards to the Italian region of Calabria: Genealogy, Culture, History and Language. We believe that segmenting our activity across each of these pillars has been extremely beneficial in providing relevant information to our members regarding the region of Calabria. We are a membership-based, global organization comprising of members from many of the world's nations. We are the largest Calabrese membership organization in the world. Since 1996, we have helped to increase visibility and awareness of our region and assisted our members in expanding their own research across these specific areas. Not only are we focused on studying these four aspects, we are actively preserving them for future generations. With all that we have to offer as an organization, it is no wonder why we have been considered the world's number one choice for those with a passion for Calabria. The genealogy of the region and its diverse origins make for an extremely interesting pastime. Many of our members are very active in this particular facet of our studies and actively assist other members with getting started in their own research as well. The history of Calabria is rich and extremely diverse. Calabria’s history starts around 9000 BC. which has been determined from early cave paintings. Our region has been known by a number of names: Italy (yes, this is the original Italy! ), Magna Græcia, Bruttium, and now Calabria. Through invasion after invasion, conquest after conquest the people have developed a very strong resilience to change. Notable historic periods of dominion: Enotrian, Laconian, Greek, Roman, Byzantine, Norman, Swabian, Anjou, Aragon, Spanish, Austrian, Bourbon and French. As you can see it changed many hands and was difficult to maintain. With each invading group, the culture of the region became continually more rich and diverse. This impacted the foods, cooking style, artistic expression, architecture, religious doctrine and shaped the thinking of the people of Calabria. The cultural impact was felt differently depending on which area of the region we are concerned with. Southern areas were heavily influenced by the Greeks and Saracens whereas the northern areas had more of a Spanish influence. Even today, with the influx of immigrants from northern Africa and Albania, the culture continues to evolve. The Calabrese people are noted for being exceptionally hospitable, yet extremely stubborn, or capotostu, as we prefer to say. As with the cultural impacts from various conquests, the languages spoken within the region have diverse origins. Add the rough mountainous topography into the picture and we see the languages diverging ever more rapidly from location to location. Originally descended from Proto-Latin, it has taken on more flavor with heavy influences of Greek and lesser influences of Arabic and Albanian. Since Italy’s unification, standard Italian has been taught in schools, but there are still remnants of the old languages in every town with the older generations still speaking them almost exclusively. Another few generations will most likely see the languages diminishing and becoming extinct...but not if we can help it! Who is Attracted to the Organization? Individuals who are interested in genealogical, historical, linguistic, or cultural research relevant to the region of Calabria. Experts and novices alike share a common love for the region and communicate frequently about it. We have been particularly adept at attracting those researching their own genealogies. Why Should I join ICC? To share your love of Calabria and learn more from others with a similar love of our region. You need not be an expert, but merely willing to learn more about our region and wish to participate in the discussions and events as they occur. There simply is no other organization that offers what we do! There are so many benefits for joining, that we are confident you will love being a part of our global organization. Joining is very simple, it takes only 5 minutes to apply! Delay no longer--Apply now to begin learning and sharing information about Calabria!